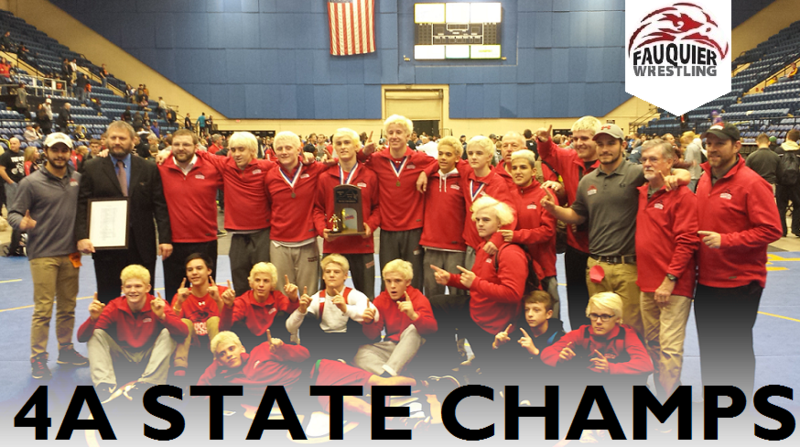 On Saturday, February 20 Fauquier wrestling team became the first team in Fauquier County history to win a state championship title twice in back to back years. To lose seven starters from a year ago and have the strength to make a run for the state title is pretty surprising. The Falcons had the following state placements: 113 lb Kyle Budd and 160 lb Garrett Tingen earning 1st place, 138 lb Kyle Roche and 170 lb Clifford Harrison taking the silver, as 126 lb Ty Foster and 145 lb Caleb Strum brought home third place medals. Team Fauquier needed every point of the 114.5 points earned to capture the crown over the 4A #1 in-season ranked Eastern View. But the last post season event had six Fauquier wrestlers recognizing the key points that Coach Doug Fisher addressed to them to make for an astonishing finish to the 2016 season. If any one of these six State placers had underperformed at the State meet most certainly the 2016 State Championship would have taken a different course. "Stay on our offense, work to score points and open up matches. Have fun!" were the words used by Coach Fisher as he addressed his team after the team finished its warm up before the first round on Friday. This message was simple but effective. For any wrestling team to win a state title you need to have numbers and Fauquier brought eight wrestlers and by day two of the Championship the Falcons were down to six wrestlers. In comparison, the East Region Champs, Eastern View brought 10 wrestlers and all were still on deck on day two of the State tournament. The result of which was that Eastern View would place all 10 wrestlers and they would earn additional team point, but Eastern View was still in second place 1 point behind Fauquier. At the conclusion of the state championship I like others was filled with questions. Of course one question might have been - how could Fauquier be on top of the leader board after the first day with only six wrestlers scoring? Surely it was not their California bleached blond hair nor the referring as a factor as Fauquier truly controlled their own pathway. But only having six wrestlers and winning 10 matches on Friday had the Falcons picking up more team points at the end of those first three rounds. As team Fauquier went 10-4 on the first day the Falcons earned five pins and two technical falls to boast 13 extra team points as they held the lead by 1 point with 85.5 points over Eastern View. But holding a 1 point lead heading into day two those six Fauquier wrestlers continued to rally to earn pins just as they had all year and the referees continued to slap the mat three more times to match the falls the Eastern View wrestlers would also score. The message had been ingrained with this 2016 team that they were mentally ready to give everything they had to score maximum team points and pins when and if they had the chance. Coach Fisher noted "Bonus points from pins, techs and majors is comparable to having multiple additional placers on the team." To look at the opening round further as a key moment for team Fauquier as the State Championship title was also decided by 13 point difference, 114.5 points to 101.5 for Eastern View final team score. Without question earning these bonus points was a huge factor. Fauquier had three head-to-head matches with Eastern View and the Falcons had the upper hand by posting a 2-1 head-to-head record with them during the State meet. One of the key matches for team Fauquier was the opening round on day one where 170 lbs Clifford Harrison won a hard fought 4-0 match over Zac Brown from Eastern View. As Fauquier went 6-2 in the opening round as Eastern View posted a 3-7 record. The Harrison victory over Brown could have made the difference on what team brought home the first place trophy. A win for Fauquier and a moment that showed Salem and the other 4A schools that Fauquier was on a mission to repeat as the Virginia State Champs. But again team Fauquier had many factors in play as this was just one moment that swung in favor of the Falcons. Another huge moment came from sophomore, Kyle Budd as he faced not one but two State Champions from a year ago. Budd took a second last year to DJ Ahalt of Courtland and these two wrestlers would face off once again but this time it was in the Semi-Finals of the State Championships. Budd pinned his first opponent Zeph Frankart of Louisa County in the first round to set this Championship Semi-Finals match up with DJ Ahalt. Budd won a very close 1-0 match over Ahalt as Budd earned an escape in the second period for a point and the 1-0 lead. The third period had Ahalt on bottom as Budd was able to stay in control throughout the entire period to secure the win. This match, as every semi-final victory does, generates substantial team placement points and advancement points. The Semi-Final victory by Budd for team Fauquier might had been another key instant that can be looked at on why Fauquier was battle tested and was on its way to win the 2016 State crown. Momentum is a word used in sports to describe how one can get motivated mentally by an individual win that carries onto other team members to inspire them to want to win as well. Flash back to the 2015 State Championships from a year ago, Kyle Budd as a freshman and wrestling 106 lbs then won his State Semi-Finals match which gave the team a boost and help pushed five Falcons onto the State finals then. Amazing effort by Kyle Budd then and even more remarkable effort to win a tough 2016 Championship Semi-Finals over DJ Ahalt and advance onto the State finals for a second straight year. "Kyle�s semi-final match certainly set the tone for our effort Friday evening" noted Fisher. Fauquier had six wrestlers on deck in the Championship Semi-Finals, and the Falcons went 4 and 2 in this round pushing 4 wrestlers to the Championship Finals. In addition to Kyle Budd advancing forward, 138 lb Roche, 160 lb Garrett Tingen, and 170 lb Clifford Harrison all won their Championship Semi-Final matches respectably to end day one giving Fauquier the slim one point lead. When you lose in the Championship Semi-Finals you then drop to the consolation side of the bracket where both 126 lb Ty Foster and 145 lb Caleb Strum moved. But just like the first round both Foster and Strum took care of business and won their Consolation Semi-Finals first round matches on Saturday and earned bonus points. "Caleb and Ty did a fantastic job Saturday morning. Both lost devastating matches in the Semi Finals, and coming back mentally from those types of losses is one of the toughest thing to do as a wrestler. Not only did they win in the Saturday morning consi-semis round, but they were on a mission to get as many bonus points as they could to help the team with Ty getting a fall and Caleb a major" Coach Fisher noted. Before the Championship Finals the team score had Fauquier with 104.5 points and Eastern View 97.5, a seven point difference. Fauquier had four bouts in the Finals as Eastern View had three. The 113 lbs Championship Finals had Kyle Budd winning 7-4 over Aaron Black of James Wood. Black was able to score a takedown on Budd with 15 seconds left to go in the first period to take the lead 2-0. Black opted to go down to start the second period as Budd earned a set of back points to tie the match 2-2. Black then scored a reversal at the 30 second mark as Budd then responded with reversing Black to tie the match 4-4 to close out the period. Black let Budd up to start the third period giving Budd an escape and the 5-4 lead. As Budd and Black were in on shots during this period Budd was able to score a take down the last 10 seconds of the period to take the 7-4 win. This win gave Fauquier +4 points as team Fauquier would move up to 108.5 points. Last week Kyle Budd lost to Aaron Black in the Regional West finals as Budd had the desire to rebound and becomes the second Falcon ever to win the State Championship as a sophomore. 138 lb Kyle Roche lost 13-3 to Jacob Curling - Great Bridge. Team Fauquier still held an 11 point lead heading into the next weight class. The next bout 145 lbs had the first of three wrestlers from Eastern View as Bret Shurina (EV) won an overtime 6-4 match Chad Cantrell (LCA). This win rewarded +4 team points and brought Eastern View team score up to 101.5 points and Fauquier held a 7 point lead over Eastern View. Eastern View then had their second finalist at 152 lbs Matt Laird in the Championship Finals and Cade Kiely from Loudoun Co. won overtime 4-2. The team scored stayed the same with no change by either Fauquier or Eastern View. The third head-to-head match that team Fauquier would have with Eastern View was the 160 lb Championship Finals where Garrett Tingen and Kaden Woodward would battle. During the first period Tingen was able to get the first take down and rode Woodward through the first period for a score of 2-0. The start of the second period Tingen opted to go down as Woodward let Tingen up boosting the score to 3-0. Tingen got in on two take downs while letting Woodward up in the exchange to go up 7-2 to end the 2nd period. As the third period would start the Eastern View coaches opted for Woodward to choose the top position. A bit confusing to some as Woodward would then be starting in the top position for both the start of the second and third periods. This does not happen often if ever as most of the time choosing bottom or the standing position would allow wrestlers to more commonly score. In the third period, all Tingen needed was 12 seconds to earn a fall from the bottom positon. As Woodward was riding high over Tingen�s shoulders, Tingen pulled Woodward�s head over for the unstoppable pinning combination and fall. The last Falcon on deck in the State Finals was 170 lbs Clifford Harrison. Harrison lost a close 6-2 Final match to Stanley Smeltzer � Smithfield. Clifford went 2-1 and became a 2x State runner up as a Falccon. Team Fauquier went 2 and 2 in the Championship Finals and 5 and 3 in the three rounds on day two which was all that was needed to be the State Champions for the second time. Fauquier took a second place in 2014 and then won the state title in 2015. Being able to overcome many factors Fauquier was still able to beat the odds to bring home the 2016 State Championship Title. Q: Coming in second place in 2014 and winning the State Championship in 2015 and losing seven seniors � How did team Fauquier do it? And any comparison from last year team and this one? Coach Fisher: "The guys were well prepared. Our in-season training cycle is designed for us to peak at the State Championships. They believed in their preparation and they executed. When the State Championships ranks as the 4th toughest event on your schedule, it doesn�t become nearly as overwhelming. The guys that scored points for us this year were also guys that scored points for us last year with the exception of Caleb Strum. Caleb became another Fauquier wrestler that went from being JV to a high state place-winner. That is both a testament to Caleb�s hard work, and the strength of the Fauquier Wrestling Program." Q: You needed your wrestlers to earn bonus points to stay in first place throughout the state championship and they did? Any reflections with that? Coach Fisher: "We push bonus points every practice and every competition, even when bonus point will have no impact on the event outcome. In doing so though, it becomes ingrained in them to open up matches, keep scoring every period. The bonus points that we earned at the State Championships was equivalent to having two additional placers." Q: At the beginning of the season you talked about the 1% improvement - What does this mean? Coach Fisher: "Well, that is proprietary information that we have made a hallmark of our program. Suffice it to say, that it is a core fundamental principle to our consistent success." 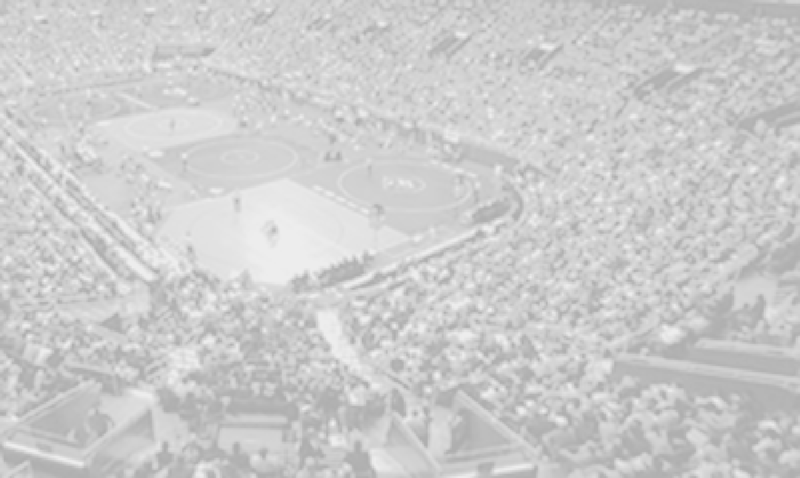 Q: Having five of the eight State Championship qualifiers wrestlers returning, how important is that? Coach Fisher: "It is a tremendous advantage having 5 returning wrestlers that have competed in the State Championships. The experience they gain as underclassmen is invaluable going into next season. " Congratulations to Team Fauquier for winning the 4A State Championship for the second year in a row - Back to Back and Mission Accomplished. Note: Team Fauquier went 2-2 with one pin. Note: Team Fauquier went 2-0 with 1 pin. Note: Fauquier went 6 - 2 with 4 pins.